Elena always had time for us, was very dear and was competent in answering all our questions. Cynthia is a very affectionate trainer. She was always very well organized and had an intimate bond with the dolphins. Dolphin Therapist Igor is very kind, friendly and helpful. He carries out his work most professionally and with feeling and love. Waldemar danced, played, sang and swam with Flip during the therapy. I noticed results straight away and am looking forward to further developments. Through the therapy Waldemar has become more concentrated, alert and happy. 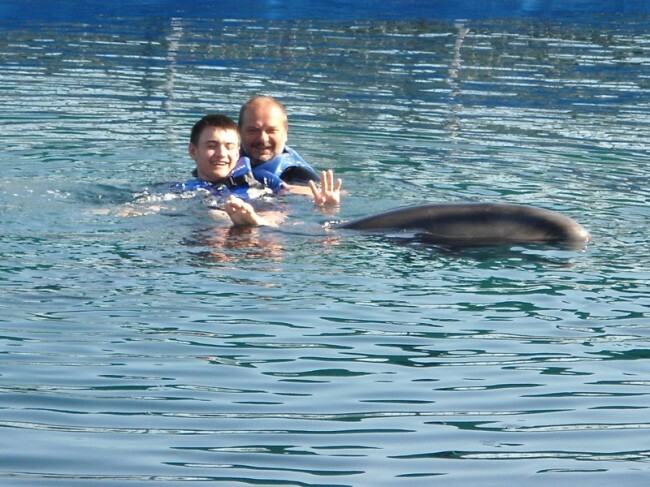 The Dolphin Therapy was a great experience for Waldemar, one that he really enjoyed. Waldemar did not want to fly home, he wanted to stay with the dolphins. Waldemar looks at the photos and watches the video joyfully every day and has very positive memories of the wonderful time in Marmaris. We would love to repeat the therapy with you. Thank you for all the kindness, help and comprehensive support from all the people that we met.